As bulldozers moved into position yesterday to resume clearing of bushland in the path of the controversial Roe 8 highway project through Perth’s Beeliar Wetlands, Beeliar Aboriginal custodian Corina Abraham said that by ‘desecrating this place, it’s like the Barnett Government is throwing sand in the face of our ancestors’. In an echo of the recent Standing Rock US indigenous protest, Aboriginal people from other parts of Australia have taken up residence at the Beeliar Wetlands Protectors Camp on North Lake Road Coolbellup over the last month to support local Aboriginal custodians like Ms Abraham. One WA Government policy document has identified the Beeliar wetlands area to be impacted by Roe 8 as ‘the most significant [Aboriginal] historical site within the Perth metropolitan region south of the Swan River’. In 2015, Aboriginal Affairs Minister Peter Collier’s advisory group, the Aboriginal Cultural Material Committee (ACMC), reversed its earlier February 2013 recommendation against granting consent to the project under the Aboriginal Heritage Act (AHA), after deciding in controversial circumstances that a significant archaeological site in the Roe 8 pathway was no longer a site, on the basis of a cursory investigation by Department of Aboriginal Affairs archaeologists which involved digging a 20cm pit. WA Greens MLC Lynn McLaren has since called for a proper archaeological excavation of the deregistered site. At the time of the ACMC decision, the committee had only two Aboriginal members (one of them a State Government employee). Although s 28 (3) of the AHA prescribes that the ACMC must have a specialist anthropologist, the position has been vacant since 2013. Unusually for a major project of this nature, Minister Collier’s Roe 8 Aboriginal heritage approval contains no requirements for an Aboriginal heritage management plan or Aboriginal monitoring of works. In 2016, Corina Abraham unsuccessfully challenged the flawed Roe 8 Aboriginal heritage approval process in the WA Supreme Court. Federal Environment Minister Josh Frydenberg is required to make a decision on her application under Federal Aboriginal heritage legislation after 11 January. ‘This place is as important for Noongar people as the South Perth Windmill or ANZAAC Cove is for non-Aboriginal people, ‘says Ms Abraham. ‘All our old fellas lived here, and they died here too. It’s like a big church to us, it’s a place of meaning, a place where we come when we’re feeling down and out: we come and connect when we’re feeling lost. Whether you go down the right path or the wrong path, you come back to this place, and you feel connected’. WA Department of Aboriginal Affairs media: Damian Katich 6551 8172 or 040 988 1920. For further testimony on the significance of the North Lake and Lake Coolbellup area to Noongar people, see statements at 2011 rally by Revd. Sealin Garlett and Corina Abraham at: https://www.youtube.com/watch?v=5sRk18MxVjQ. The Yawijibaya people, reported to be ‘giants of the north’ stood up to 7ft tall and were of superior physical makeup. They lived on the High Cliffy Islands near Montgomery Reef in the West Kimberley, subsisting off the rich marine ecosystem of the area. Soon after this footage was captured in 1929 the tribe of 300 people disappeared without a trace. Another facet of Western Australia’s fascinating history. NOTE: This footage is shared from ‘Sovereign Union’ Facebook page, original text is posted below. One of the tribes that disappeared without trace. Off the north-west coast of Western Australia is the High Cliffy Islands, home to the Yawijibaya people. Archaeological evidence suggests they have occupied these islands for 7000 years. Anthropologists described them as giants up to 7 ft tall and of superior physical makeup. Soon after this footage was captured in 1929 the entire tribe consisting of some 300 individuals disappeared. Without a trace. Aboriginal adaptation in Northwest Australia / by Valda J. Blundell. Noongar custodians of the Beeliar Wetlands area have welcomed today’s decision in the Supreme Court by Chief Justice Martin to overturn the Barnett Government’s EPA approval of the Roe 8 project, which would have destroyed one of the most significant historical and mythological places for Aboriginal people in the entire Perth metropolitan area. It is noteworthy that the EPA also ignored its own guidelines on Aboriginal heritage protection in granting Roe 8 approval (see attached EPA appeal submission). Justice Martin’s decision means Noongar opponents of the Roe 8 project will redouble their efforts to protect this culturally significant area by challenging the similarly flawed and dishonest Aboriginal heritage approval for Roe 8 presided over by the Department of Aboriginal Affairs and Minister Peter Collier (see attached DAA internal assessment report). In granting s 18 Aboriginal heritage approval for the Roe 8 project to impact Aboriginal sites in the Beeliar Wetlands area, DAA’s advisory committee (the ACMC), first determined in highly controversial circumstances that two archaeological sites in the Roe 8 pathway were no longer sites, then reversed its earlier February 2013 decision to reject the project on Aboriginal heritage grounds. Today’s decision parallels Justice Chaney’s April 2015 Robinson v ACMC Aboriginal heritage decision which found that DAA’s deregistration of a sacred site in Port Hedland Harbour was also legally invalid. Chief Justice Wayne Martin has also previously ruled that EPA approvals for Woodside’s James Price Point LNG project were unlawful, due to conflicts of interest by EPA Board members involved in the approvals process (the JPP project had also earlier been found to be invalid on another legal point, after it was discovered the WA Government had botched the land acquisition document). All three cases highlight the extent to which the State Government has attempted to subvert due environmental and Aboriginal heritage approval process through direct political manipulation. It is indeed heartening that the WA Supreme Court has taken such a firm line against these attempts by the Barnett Government to run WA as a state of exception operating outside the rule of law, with scant disregard for its legislative responsibility to protect Aboriginal and environmental heritage. For further information documents on the Beeliar wetlands, see the EPA Submission by Dr Stephen Bennetts of AHAA and the Department of Aboriginal Affairs internal site assessment by clicking the respective links below. Let’s preserve heritage for Western Australians, preserve heritage for all! *AHAA acknowledges all Aboriginal & Torres Strait Islander peoples, their culture and their country! 3. And to remove references to ‘honorary wardens’ in sections 51 & 52. Submission Received By: (Generally) For or Against AHAB? WA’s Aboriginal Heritage Action Alliance (AHAA) is marking today’s Yule River bush meeting of Aboriginal custodians with a call to the State’s Minister for Aboriginal Affairs Peter Collier for the reinstatement of 36 Aboriginal sacred sites which were unlawfully deregistered by the Department of Aboriginal Affairs’ Aboriginal Cultural Material Committee (ACMC). The sites were all deregistered following applications by developers to ‘disturb’ them under s 18 of the Aboriginal Heritage Act (AHA). Minister Collier later granted s 18 ministerial consents for 37 sacred sites to be ‘disturbed’. The WA Supreme Court’s Justice Chaney ruled in a landmark Port Hedland test case on April 1 that the narrow definition of ‘sacred site’ used by the ACMC to deregister one of the 37 sites was invalid, and referred the site back to the ACMC for reassessment. Minister Collier later tabled in State Parliament the names of 36 sacred sites which had been unlawfully deregistered using the same flawed and narrow State Solicitor’s Office interpretation of ‘sacred site’ under s 5b of the AHA which was overturned by Justice Chaney. 34 out of 36 of these sites were said to be the subject of actual or proposed development. He also stated on 15 September that 11 previously registered sites had been removed from the DAA site register since the Chaney ruling on 1 April this year. Given these circumstances, and DAA’s lack of response to Chaney’s Robinson v ACMC since April, AHAA today announced it was ‘doing what DAA should have done five months ago, and is writing to Aboriginal custodians of all the deregistered sites’, urging them to demand the immediate reinstatement of all 36 sacred sites to the DAA site register. Yamatji man and AHAA spokesperson Clayton Lewis, a senior custodian of one of the 37 deregistered sacred sites, said today: ‘It’s ironic that Justice Chaney delivered his decision on April Fool’s Day, because DAA’s response since then has been a bit like a bad April Fool’s Day joke’. ‘Nearly six months on, I haven’t received any correspondence from DAA admitting they unlawfully deregistered the important Monger’s Lake Waterway sacred site in our country in the Mid-west, or telling us what they propose to do about it. We’re not aware DAA has contacted a single custodian for any of the other 36 sacred sites, or published a revised version of the DAA Guidelines which Justice Chaney said were legally invalid’. ‘We also don’t know whether Peter Collier has withdrawn any of the legally invalid s 18 ministerial consents he issued to developers, or whether the companies have already gone ahead and destroyed the sites’. AHAA is currently seeking legal advice as to whether Aboriginal custodians of these sites could sue the Minister, the ACMC or the State Government if any of the sites have been damaged. The Aboriginal heritage advocacy group is today also releasing the attached map showing the location of the deregistered sacred sites, as well as a further 83 ceremonial and/or mythological sites deregistered under the Barnett Government since 2008 which have been identified by University of Western Australia Archaeology Department researchers Dr Joe Dortch and Dr Tom Sapienza. The Minister has also stated in Parliament that a further 16 (so far unidentified) sacred sites failed DAA registration solely on the basis of the SSO’s flawed s 5b sacred site definition. ‘Given these sacred sites were wrongly deregistered by DAA in the first place, why hasn’t it just put them back on the register?’ asks Lewis. ‘The Minister and his DAA Executives recently made a big song and dance in Parliament saying that all 37 sites now need to go through a complicated reassessment process which might take DAA months and months. This seems pretty strange, given that under its current Chair, the ACMC has been able to assess dozens of sites literally before lunch time, many of them unfavourably. As far as we know, DAA still hasn’t reassessed a single one of the 37 deregistered sacred sites. We also can’t understand why the Minister thinks Justice Chaney’s decision needs to be referred back to the State Solicitor’s Office for further advice, when it was the SSO which caused the problem in the first place by providing its ridiculous definition of a sacred site’. Clayton Lewis’s 3 August letter to the Minister requesting immediate reinstatement of the Monger’s Lake Waterway sacred site, of which he is a senior custodian, has received no response to date. See: https://www.facebook.com/aboriginalheritagewa/photos/pcb.1494900327487865/1494900090821222/?type=1&theater. 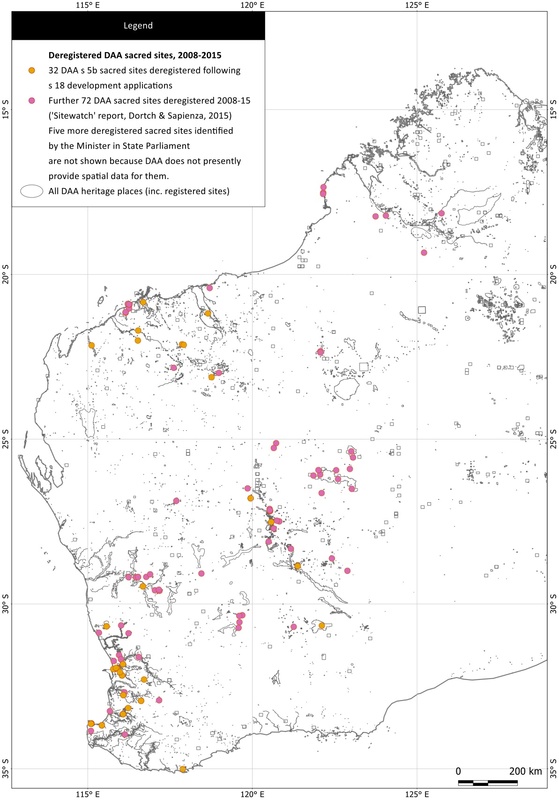 The location of the deregistered sacred sites, as well as a further 83 ceremonial and/or mythological sites deregistered under the Barnett Government since 2008 which have been identified by University of Western Australia Archaeology Department researchers Dr Joe Dortch and Dr Tom Sapienza.